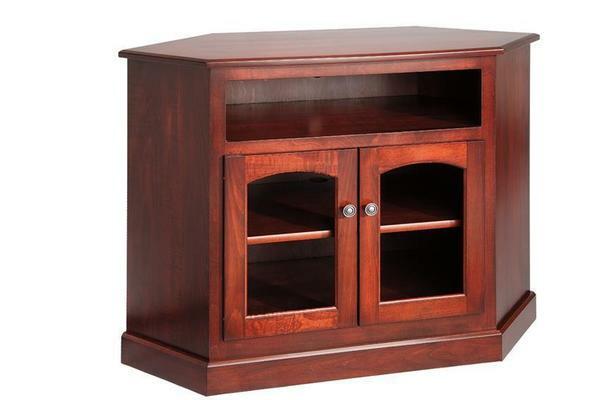 The Amish 44" Manchester Corner TV Stand fits comfortably in one corner of your living room, family room or den! This handy space saver provides the perfect display stand for your television while providing you with extra storage for your favorite music, movies and more! This shapely stand has a spacious opening to house your DVD player while tucking storage shelves below right behind two attractive doors handcrafted in the premium hardwood of your choice! Here we show the Manchester in Maple wood. Brown Maple wood polishes handsomely and looks magnificent in chocolate and cherry tones. Dimensions: Width: 44" Center Depth: 18" Height: 32" Wall Width to Side Corner: 31" Front Corner Width: 11"
Consider our Amish Topeka Plasma TV Stand for another option. Wall Width to Side Corner: 31"